"The propaedeutic stage is an indispensable phase of formation with its own specific character. Its principal objective is to provide a solid basis for the spiritual life and to nurture a greater self-awareness for personal growth. 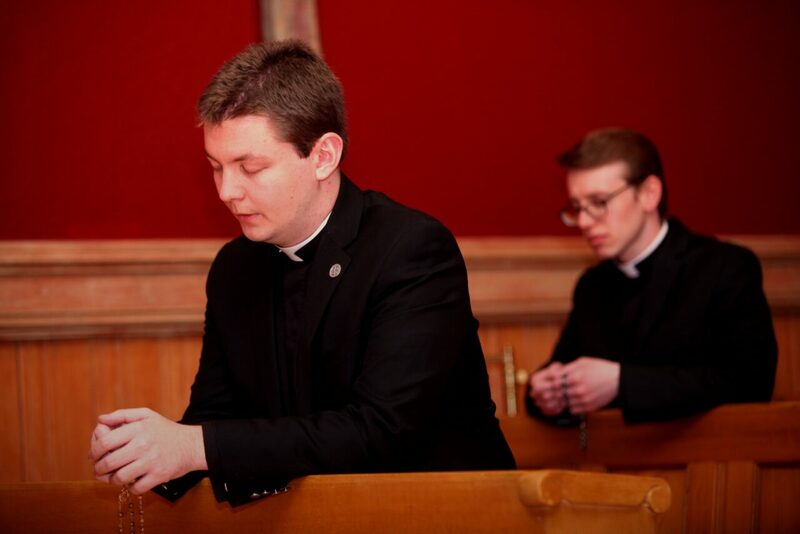 In order to launch and develop their spiritual life, it will be necessary to lead seminarians to prayer by way of the sacramental life; the Liturgy of the Hours; familiarity with the Word of God, which is to be considered the soul and guide of the journey; silence; mental prayer; and spiritual reading." Two Holy Hours per day with time spent before the Blessed Sacrament are central. The encounter with God in the Holy Hours flows from and leads back to the celebration of the Holy Mass and is supported by the recitation of the Divine Office during Morning and Evening Prayer. There will also be time for the Rosary and private devotions. Seminarians pray, study, work, eat meals, go to classes and seminars and retreat together. This atmosphere helps the seminarian move towards a life of Christian charity and helps to form close friendships and a mutual sense of being called to serve as brothers in Jesus’ vocation and mission as diocesan priests. On weekends, seminarians will visit different parishes in order to experience the local Church. Meals and prayers provided by the Oblate Sisters of Jesus the Priest. Meeting with his seminarian directee for 30-40 minutes each day, the spiritual director will support the seminarian in this valuable experiential period of formation. Fr. David Robinson, SJ: Associate Director of Spiritual Life, Spiritual director for both 30 Day and 8 Day Ignatian retreats. Fr. Tom Sherman, SJ: Professor of Philosophy at Pontifical Gregorian University. The First Session of the Summer Spirituality Program for Seminarians will be led by Fr. David Robinson, SJ and Fr. Khoa Nguyen, OFM. Experts in Catholic Spirituality will join us for conferences, spiritual direction and community discussions. This session responds to the Church’s need for diocesan priests to be men of prayer. Consequently, the ambiance of the summer program will be one rooted in deep prayer and contemplation and study of the Scriptures and the Catechism. Retreat participants will be introduced to the great spiritual masters, such as St. Anthony of the Desert, St. Bernard of Clairvaux, St. Teresa of Avila, St. Francis of Assisi, St. Thomas Aquinas, and St. John of the Cross. Of special note is the Media Fast. As a sign of turning from the noise of the world towards God, the teaching of the Church and the spiritual masters, the participants will give up the use of phones, television, computers, popular media and other electronic devices from Monday to Saturday afternoon (access is allowed on Saturday evenings and Sundays). As a result of the Media Fast, a new interior freedom is invariably experienced, as well as a silence and stilling of the heart and mind. The last 8 days are reserved as an Ignatian Retreat. The Second Session is open to seminarians who have already completed the first session of STPSU's Summer Spirituality Program or have already participated in at least one retreat experience of multiple days. The retreat follows the 30 Day Spiritual Exercises of St. Ignatius of Loyola. The seminarian-retreatant easily settles into the prayerful seminary setting and quickly enters into the grand silence. In entering into the meditative and contemplative elements of the retreat, he will come to recognize the self-revealing love of God in his particular life. Through his encounter with God in prayer, the sacraments, and daily examen, the seminarian will come to understand the nature of his call. He is unique in his relationship with the Lord. Each day begins with Mass and ends with Eucharistic Adoration. While Morning Prayer is prayed alone, Evening Prayer is prayed with the other retreatants. Each retreatant also receives daily spiritual direction from his assigned spiritual director. Open to all STPSU and non-STPSU seminarians.